Leslie Hewitt is an artist based in New York whose work engages with the ways in which photographs encode time and mediate historical understanding. 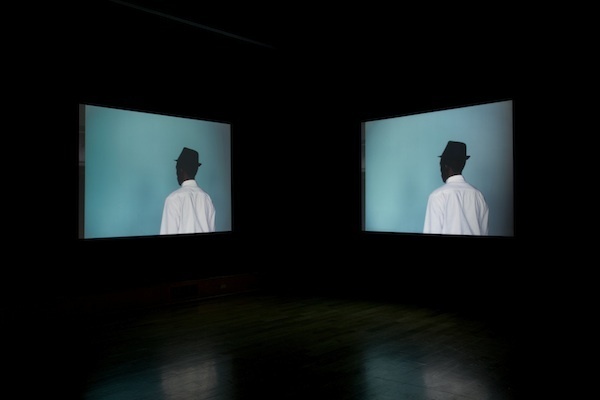 Her dual-channel video installation Untitled (Structures), 2012, is a collaborative project with cinematographer Bradford Young, developed from the Adelaide de Menil Carpenter and Edmund Carpenter photography collection, which comprises documentary images of the civil rights era captured by artists such as Elliott Erwitt and Bruce Davidson. The work is on view at the Des Moines Art Center through January 27, 2013, when it will travel to the Menil Collection in Houston and the Museum of Contemporary Art, Chicago. I WANT TO PUSH AGAINST NOSTALGIA. Whenever you deal with historical materials, that’s the emotion you can easily find yourself struggling with. Though the civil rights movement is often understood in the time frame of the 1950s and ’60s, history does not enclose itself within brackets. Episodes from America’s past reach far into its present, and we always have a connection to them, even if our understanding is full of breaks and disjunctures. The sites recorded in Untitled (Structures), located in Chicago, Memphis, and parts of Arkansas, were all palpably transformed by the Great Migration and the civil rights movement that ensued. The fact that many appear abandoned, evacuated, or awkward in our context is telling. The feel of these now vacant, transitional spaces seems, disturbingly, to mirror the way that we perceive this moment in the present. Like others who grew up in the 1980s, well after the movement’s height, I have a sense of malaise, a dual feeling of connection to and disconnection from that period in time. Feelings of distance coincide with a deep-seated desire for closeness. This collaborative project allowed us to isolate these complex emotions and represent our generation’s relationship to that moment cinematically. Much of my work creates relationships between images and objects whose connection is not necessarily apparent. Elements that seem dissimilar, when paired in a formal space, reveal unexpected affinities. In film space, this effect could be achieved through a jump cut, where two shots are abruptly juxtaposed. Moving between outdoor and indoor scenes—from, for example, a yellow wheat field to a yellow door centered in a wall—enables one to access in-between spaces that are otherwise invisible. I’m drawn to these moments of compression where experiences with different senses of space and time collide. In Untitled (Structures), the two video channels project onto perpendicular walls. You can decide to look at one or the other, but your eyes have to contend with both. Juxtaposing these image streams is a way of slowing down perception and expanding our sense of interiority and exteriority. You don’t just see through my eyes or the camera’s lens: The scenes become yours as they blur in your peripheral vision. Obscured, indistinct figures appear in some of the vignettes, but the camera is not merely looking at them: It’s participating with them, imagining what scenes they hold in their own peripheral views. Both your viewpoint and theirs are embedded in the installation’s form. When you take a photograph, there’s a decisive moment, an instant when you choose what to frame and when to trigger the shutter. The point of view is yours, and it’s necessarily singular. My projects point to the structure of photography to put pressure on this idea of a singular perspective and remind the viewer that every act of perception is an act of translation. In Untitled (Structures), the dissonant moments when the still images shift and begin to move gesture toward this frame within the frame. They’re moments when we become aware of our position as viewers. Without this awareness, the images fall into convention and ensure a comfortable sort of spectatorship, where one needs to neither reflect on their stance nor question the images presented. It’s important to remind ourselves that photographic meaning isn’t something that’s produced by the artist or inherent in the subject. We’re all actively involved in its negotiation, all the time.